2015 was a great makeup year for me. 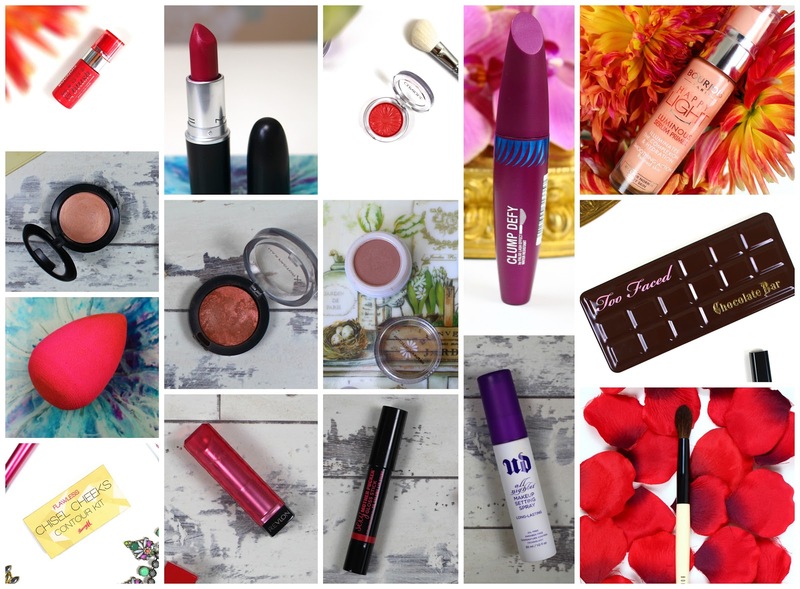 There have been so many standout items but I've finally managed to whittle it down to just 15 products. I think this might be my favourite primer. It's definitely my go to when I want a glowy base. A pump of this gives the skin a lit from within radiance, aka, my favourite kind. It helps keep my makeup locked in place and I find myself reaching for it on no makeup days too. 2015 was the year for contour kits. I'm pretty sure every brand now has some kind of designated contour palette. My favourite is the Barry M Contour Kit. It houses three powders all of which are incredibly pigmented, buttery and matte. They do kick up a lot of excess powder, but I can live with that. The yellow toned powder really brightens the under eye area without being too intense and the contour shade would work for most skin tones. I find the bronzer a bit too pink for me, but it makes a lovely eyeshadow. Ginger Pop is a stunning blush that suits all. Its terracotta hues warm the complexion and offer a summer sun glow all year round. The finish is really unique because although it is completely matte, it looks very silky on the skin. It's also very long lasting and I can't believe I haven't gotten more shades yet! I'm a fan of the Creme Puff Blush line from Max Factor in general, but the shade Alluring Rose in particular, really stood out to me. I just love this blush for days when I can't be bothered with a separate bronzer, blush and highlight. It offers the warmth I'm after, with a hint of rosy pink and a soft pearly sheen. The shimmer is very refined in all the blushes and they apply smoothly and evenly. I think the Aqua Blush range from Bourjois is quite underrated but I don't know why. The shade Berry Nice is absolutely beautiful. It offers a very pretty flush of watermelon pink that lasts about 6 hours on me. Although it's a liquid gel hybrid, it applies really easily and doesn't set too quickly, so you have plenty of time to blend. It really becomes one with the skin and is probably one of the most natural looking blushes I own, despite looking terrifying when swatched! I love this highlighter. It's peachy, it's creamy and strangely for me, there is no real shimmer. However, it offers glowy skin like no other. If you want a really dewy effect to the cheeks, this will get it done. I promise I'm not addicted to cosmetics that reference chocolate, but, the Natural Collection single eyeshadow in Milk Chocolate is such a good buy. It's the perfect matte crease colour that works well as a transition shade, an all over the lid shade or even a brow colour. It's also a bargain at just £1.99. Clump Defy from Max Factor is an excellent mascara if you want long fluttery lashes. Whilst it does offer a bit of volume, it's best when used to add lift and length to the lashes. It really holds a curl, and having tried both the water resistant and regular formula's, I find them to be brilliant at holding the lashes up. It also pairs well with my other favourite Max Factor mascara, False Lash Effect. Ahh Plumful, the loveliest sheer plum. It's a shade I think every woman should own because it's very versatile. Whether you want the slightest of plum tints or a bolder punch of colour, Mac's Plumful has you covered. This is definitely my favourite lipstick of the past year. It's a sheer berry pink that suits everyone. I love how easily it applies to the lips and I actually find the lasting power to be pretty decent. Nudist is the lip colour I go for when I have no idea what to wear. It goes with everything and is another lipstick I think everyone should own. Being a lip crayon, it's very easy to apply/reapply and I find that whilst being glossy, it's not sticky or uncomfortable. If you hate setting powder, then you'll love Urban Decay's All Nighter Setting Spray. It does everything a setting powder would, without the cake. I find my makeup lasts so much longer when I've used this and I know I can keep applying it without it ruining or changing the appearance of my makeup. I now understand why people splurge on more expensive brushes. They make all the difference to the way makeup looks. The Bobbi Brown Eye Blender brush is probably the softest brush I own and it has completely changed the way I apply and blend makeup. I can blend the hardest of powders with this brush and it will look seamless. If I make a mistake, a few swoops with this and they're gone. Last but not least is the Beauty Blender. This is another product that has changed the way I apply makeup. I can't seem to go back to brushes since using this. Truly, no foundation brush I've tried offers me the same effect. You get such a flawless, seamless yet natural finish with it. It's very light and bouncy so you can really press product into the skin, which also helps make it last longer. What are your favourite makeup products of the past year?